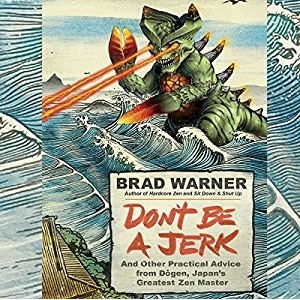 The audiobook of Don’t Be a Jerk is available now! I read it myself and even wrote a theme song. How can you beat that? You can’t. So order yours today. 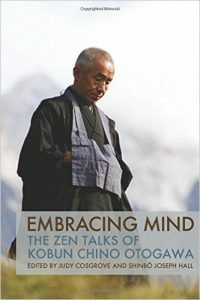 Also, the other day I ordered a copy of Embracing Mind: The Zen Talks of Kobun Chino Otogawa edited by Judy Cosgrove and Shinbo Joseph Hall. I just got it yesterday and haven’t had time to read it. But I read bits and pieces of the book that appeared on-line, so I know it’s gonna be great. Last year when I traveled through Europe, I often used quotations from these talks as the basis for the talks I gave. Kobun was my first teacher’s teacher. I never met him. I was planning to attend one of his sesshins when I heard he died. That was in 2002. Kobun told his students not to put out a book of his talks until after he was dead. Looks like they did. The book looks great. It’s published by Jokoji, the temple Kobun established in Los Gatos, California. Often self-published books look awful and amateurish. Not this one. That’s a real plus. I can tell someone really put some effort into making this book look right. Once I read it, I’ll post a review. But I can already recommend it. Yesterday I tweeted the following: There is no mystery to life at all. None. It’s all totally obvious and always has been. To everyone. Everywhere. In any era. In any land. I’m not a real Twitter kinda guy. Unlike our president, I don’t believe it’s terribly useful for real communication. 140 characters isn’t really enough to say very much. Well, of course, there are plenty of unanswered questions. And of course we feel mystified by life. I certainly do, anyway. I don’t trust anyone who says they’ve figured life out. Because you can’t. No one can. We just aren’t equipped to figure it out, if by “figuring life out” you mean understanding it intellectually. It’s way too big and complex for any human brain to comprehend in that way. And yet I stand by my tweet. The mystery isn’t in life itself. The mystery is in how we have made what is non-mysterious into a mystery. My tweet was a variation on Dogen’s well-known statement “nothing is hidden,” from his essay Instructions for the Cook. I’ve included a paraphrase of Instructions for the Cook in my forthcoming book, It Came From Beyond Zen (due out in the Autumn of 2017). It’s an essay about cooking for Zen temples that contains a lot of very deep stuff about life and its inherent non-mysteriousness. That, to me, is kind of the crux of Buddhist philosophy when it comes to defining the world we live in. It’s what really sets Buddhism apart from any other religion. Most religions tell you that there are hidden things and that these hidden things are incredibly important. For example, you can’t see Heaven or Hell or God, and you can’t know what happens after you die. But these religions tell you that after you die you’ll be judged by God according to criteria only God knows, and then you’ll be sent to Heaven or Hell forever. There are a lot of different variations on this same idea of hidden things being super-significant. But most religions seem to have that basic idea as their starting point. There is an element of control there for the proponents of these religions. The implication is that the priest, rabbi, imam, or whatever the guy in the funny outfit calls himself, knows these hidden things. So you are beholden to him to explain that which you cannot see for yourself. It’s a very effective system. Buddhism — at least Dogen’s version of it — says the opposite. Nothing is hidden. Everything you need to know is as plain as day. That doesn’t mean that the way you conceive of the things you encounter all day long every day is correct. It doesn’t even mean your perceptions are right. But it does mean that all the big answers to the important questions about life, the universe, and everything are right there staring you in the face. This is hard to accept. So the phrase “Nothing is hidden” comes off sounding absurd. Of course things are hidden! There are all kinds of important things going on right this very minute that you and I know nothing about. Politicians keep secrets that affect our lives. The Internet screams about how things you eat all the time thinking they’re just delicious snacks are giving you cancer. The whole universe seems like one giant puzzle that nobody can ever hope to figure out. Yet in the face of all that, Dogen insists that nothing is hidden. As I’ve continued doing the practice that Dogen recommended in my own half-assed way over these many years, I feel more and more like he’s right. Nothing is hidden. The problem is getting honest enough with myself to see what’s been right there in front of me all along. That’s the first tricky part. The other tricky part is to accept that there are some things you’re just never gonna understand. The downside of telling people “nothing is hidden” is that it can be misinterpreted as saying that we all already know everything there is to know. These days, with so much knowledge at our fingertips in the form of the device you’re reading this on right now, there’s a tendency for folks to think they know things they don’t know. Like when your hypochondriac uncle diagnoses himself with some exotic disease he found on Google. Or when someone thinks he can be president because he’s watched a few episodes of West Wing. That’s not what “nothing is hidden” means. What it means is that the answers you are searching for are staring you in the face right at this very moment. The real mystery is why we fail to notice. And that is a mystery worth investigating. One thing that’s not hidden is the link to send your donations to! Your donations are my major means of support. Thank you!